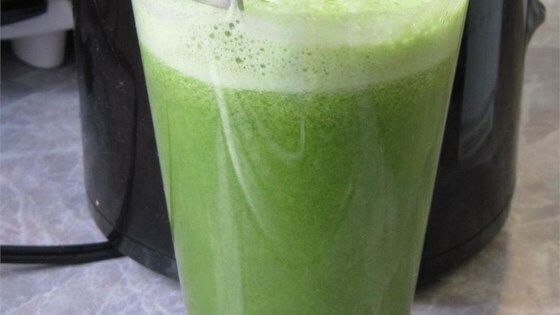 "Great healthy drink for detoxing after the holidays or whenever you have overdone it. Worth it to buy the organic celery, even if you buy conventional for everything else. Adjust fruit and veggie amounts to suit your personal taste. More apple equals a sweeter drink. Store any extra in a glass jar in the fridge for up to a day. Shake before drinking." Was drinkable and no doubt healthy but not my fav. this is something you consume bc its good for you not bc you love to drink it. This green juice tastes mostly of celery. After a few sips, I added a cup of grapes to tone down the celery and sweeten a little more. Very good. Thanks for sharing.